WOW!!! Simply Incredible... This is a Magnificent Solid Gold Antonio Fogarizzu Folding Dagger with Pen Shell inlays and Gold Pins. The knife is just beautiful and is only the 2nd he has ever done with a solid Gold frame. Antonio is one of the best Italian knife makers and his Fit & Finish is second to none. 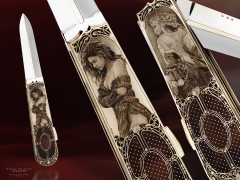 The knife was then Exquisitely engraved by Master Simone Fezzardi with some truly Beautiful women. The high detail of the engraving is one of the best we have ever seen by anyone. It is truly a "rare" combination of a magnificent "Art Knife" and an incredible engraving Masterpiece.